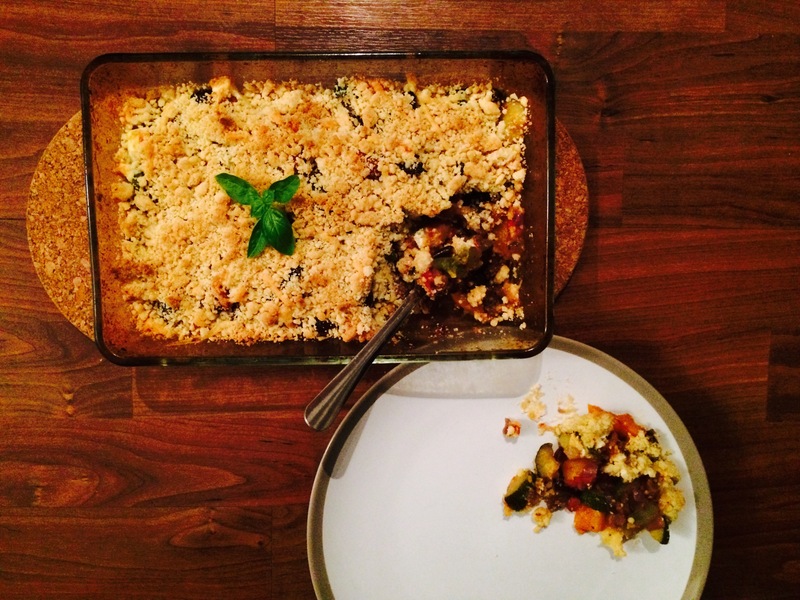 Sweet and succulent Mediterranean vegetables layered with salty, crumbly feta cheese are topped with a cheesy, soft crumble to bring you comfort and warmth on a cold and dreary autumnal evening. I love ratatouille. 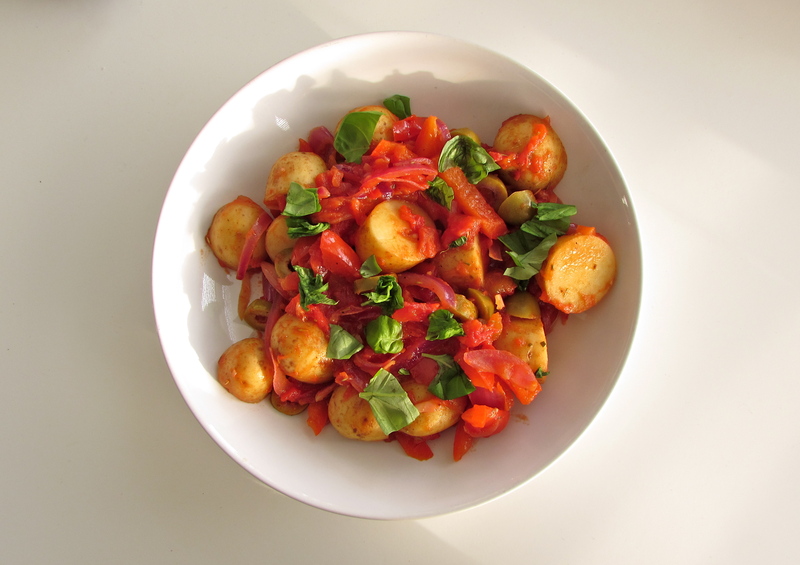 Originating from Nice in France, it’s a traditional stewed vegetable dish made up of many of my favourite veggies. It’s so colourful, so healthy, and oh so tasty. I think it’s highly underrated. 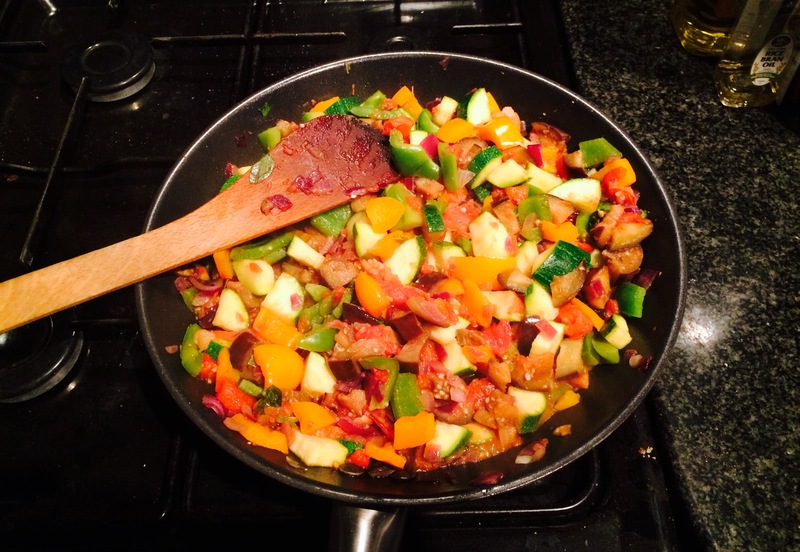 My first memory of trying ratatouille was as a teenager. In the summer holidays, I often went round my friend Jade’s house and we’d eat whatever we could find in the kitchen cupboards; cold baked beans (still a fond snack to this day), pasta, soup and the like. But by far the most memorable was tinned ratatouille. Never once had I come across this creation. This rich, tomatoey vegetable goodness. We’d warm it up and eat it on its own while watching music channels. I always remember it being absolutely delicious, even out of a tin. This version I’ve put together is a little on the naughty side; incorporating cheese and butter into the mix. But with four different vegetables, the good outweighs the bad. Put a large frying pan on a medium heat and pour in the olive oil. Add the onion and garlic and fry for 2-3 minutes. Stir in the aubergine and sprinkle over a teaspoon or so of salt to help it cook. Cook for three minutes or so. Tip in the peppers and cook for another couple of minutes. Drain the chopped tomatoes in a sieve to get rid of the watery liquid. Pour the tomatoes into the frying pan along with the courgette and basil and stir well. Lower the heat very slightly and leave to cook for 15-20 minutes, until the vegetables soften. Turn the oven on to gas mark 5. 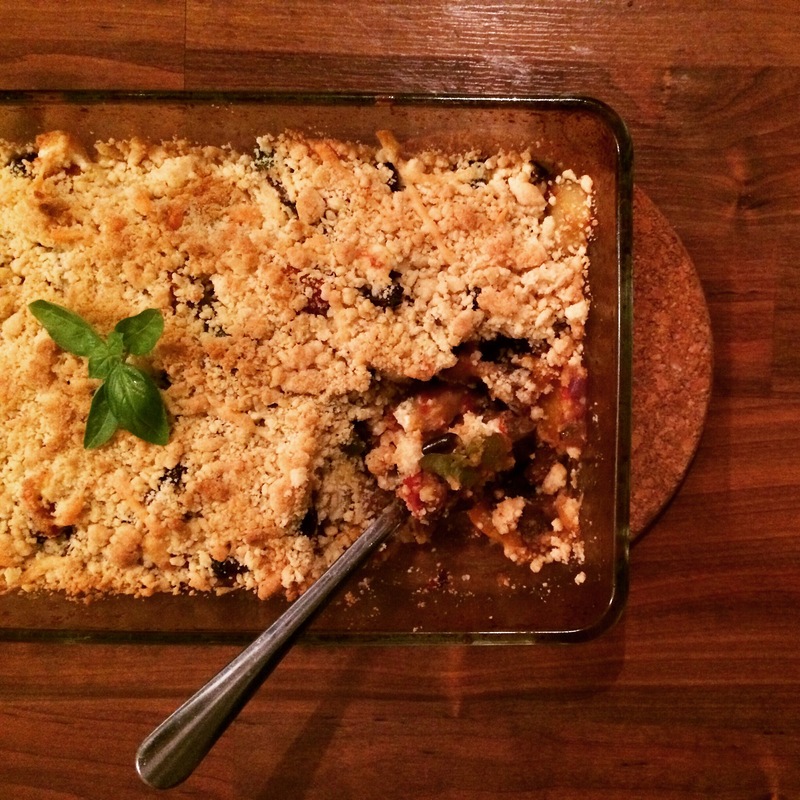 While you’re waiting for the vegetables to cook, make the crumble. Pour the flour into a deep bowl. Chop the butter up until small chunks and tip it into the bowl. Using your fingertips, rub the butter into the flour for a few minutes, until they form a breadcrumb consistency. Tip the cheese into the bowl, add plenty of seasoning and mix the cheese in with the breadcrumbs. When the vegetables have softened, pour them into a medium sized baking dish and evenly disperse them along the bottom of the dish. Season well. Crumble over the feta cheese and top with the breadcrumb mix, making sure the cheese and breadcrumbs cover the ratatouille evenly. Put in the oven for 25-30 minutes, or until the crumble has browned on top. Serve with a side of vegetables, like sweetcorn or broccoli.